Every night from the 22 to the 29 of February 2008, the vapour emissions of he Salmisaari power plant in Helsinki will be illuminated to show the current levels of electricity consumption by local residents. 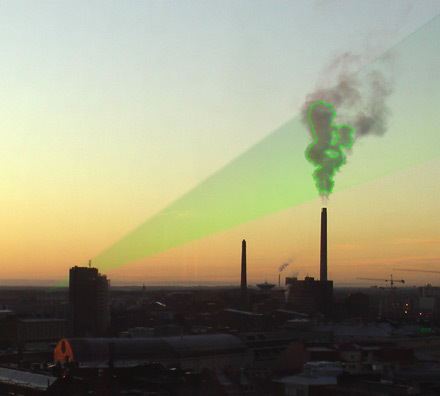 A laser ray will trace the cloud during the night time and turn it into a city scale neon sign. Nuage Vert is an artwork by HeHe (Helen Evans & Heiko Hansen) and is presented by Pixelache Festival of Electronic Art and Subcultures. 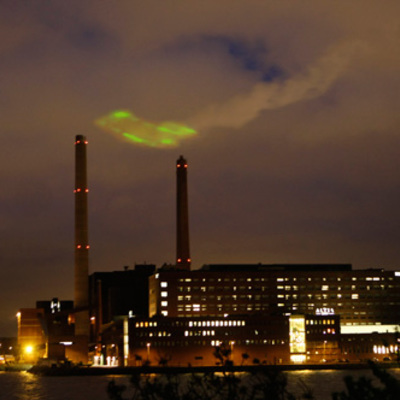 Nuage Vert / Vihreä Pilvi is a communal event for the area of Ruoholahti, which anticipates esoteric cults centred on energy and transforms an active power plant into a space for art, a living factory. In tandem, as a reversal of conventional roles whereby the post-industrial factory is turned into space for culture, Kaapeli (the cultural factory) becomes the site of operation and Salmisaari (the industrious factory) becomes the site of spectacle.